Sad times for this Mumma as we hit week #36 – its back to work on Monday as the UK half term comes to an end. We’ve been blessed with sun and lots of lovely memories from staying at my Bestie’s (currently typing this in her garden) and I’ve been playing ‘try 6000 dresses on’ as 2019 is the year she is getting hitched. We’ve been on some lovely walks as a Ohana with our dog Moët, met brand new baby Ruby (another lovely friends latest member of the squad), carried a huge inflatable dinosaur everywhere with us, eaten BBQ’s and even accomplished a bit of DIY…win. Friendship / my tribe is really important to me. I don’t have many friends, but those that I do have are literally my all. This leads me on to my featured blogger for this week – Three Time Daddy. In one of his recent pieces he discusses an issue his family had when ‘the kids fell out’ and the domino affect it had on his family and how they handled it. Its absolutely worth a click here to read it, I can see as my little dude starts his adventures of school life, how we may face similar situations. I love it when bloggers capture real life situations and what we as readers can take from them. Also anyone who can put out great content and has three kids is amazing in my eyes. 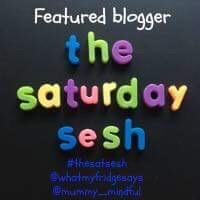 As always, Hayley has picked her own featured bloggers for #thesatsesh so you can always have a cheeky look at her’s too – click to link to her blog or stay here, read the rules below and join week 36 of this lovely community.